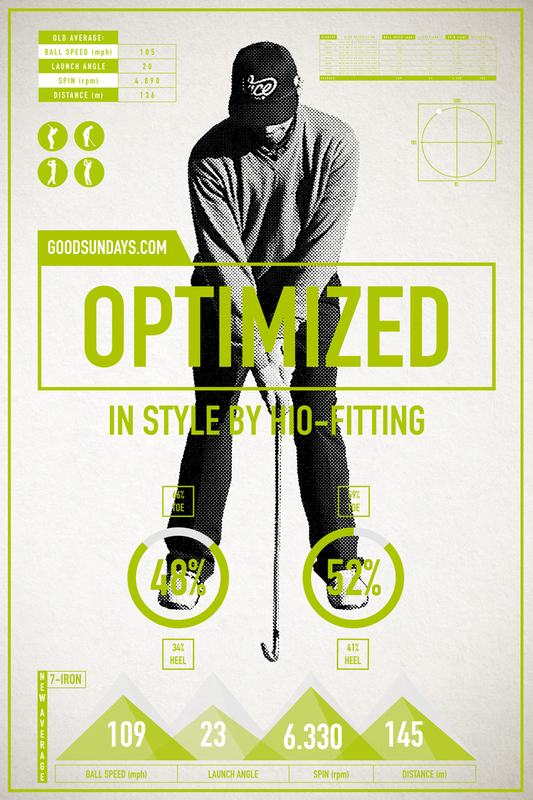 Sure, goodsundays.com is basically about style, emotions and documenting my view on the wonderful game of golf. But golf is also about performance and perfection. Which is why I started the project “the swing thing” together with my coach Arne Dickel. Arne has managed to boost my confidence in my swing and increase my skill level immensely – to such an extent that I needed hot new equipment to do my improved swing justice. Plus, I noticed that the length determination of my old irons did not fit. Some irons of my old clubs gave me pretty much the same distance, so there was no way around for new irons. During my exciting trip to the PGA Show in Orlando, I met the three guys from HIO Fitting, a talented, young and fresh fitting team headquartered in Munich … a perfect fit for me! From the first second I saw their stuff, I felt a connection. I love their idea of fitting clubs that are customized to my measurements, my golfing ability and my swing, but what I loved even more was their approach of bringing a design aspect to the very performance-oriented business of club fitting. A black shaft with a black gunmetal clubhead and an orange grip … that’s just cool. The transition (mid-down) in the downswing is defined as having the shaft in a horizontal position. The goal of this position is to minimize the angle between the left forearm and the shaft to create maximum lag. In order to transfer a maximum of power to the ball it is necessary to displace weight from the rear foot (40%) to the front foot (60%). The weight shift to the front foot supports increasing club head speed to impact. The most common mistake during the downswing is putting too much weight on the toes. The balance at the toes supports a swing that works across the ball from outside to inside, promoting a pull, slice or fade. A neutral COP in toe / heel direction helps to bring the club head back to impact in a neutral position for solid ball contact. Ideally, the weight is almost perfectly balanced between toe 55% (both feet) and heel 45% (both feet) at mid-down position. Within the front foot you expect 50% toe and 50% heel balance. In contrast, the right foot should be around 60% toe and 40% heel balance. My weight transfer looks quite good as I have 70% of my weight on the left foot at this position. For this type of downswing, HIO Fitting recommended going with a heavier steel shaft combined with a stiffer tip section. This could increase my accuracy and my feeling for the position of the head. 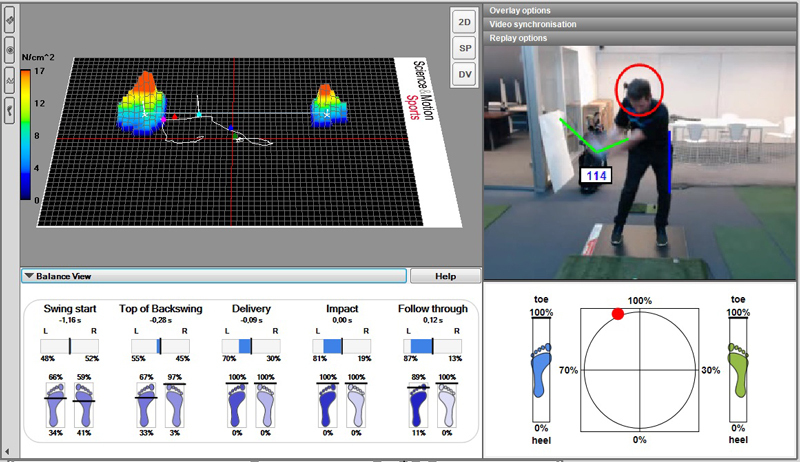 The force plate from Science and Motion is quite a powerful tool to find the correct shaft for each type of player. Without it, you can easily get lost in the wide maze of available shafts. Due to the fact that I am completely on my toes, there is still a lot of room to improve. If I can manage to stay more neutral during my downswing, I will be able to hit the ball in the center of the clubface more often. The last aspect is about my downforce value – the more force I can put down on the plate, the more power I can transfer on the ball. Only if my swing is 100% efficient I can get the maximum distance out of my speed. 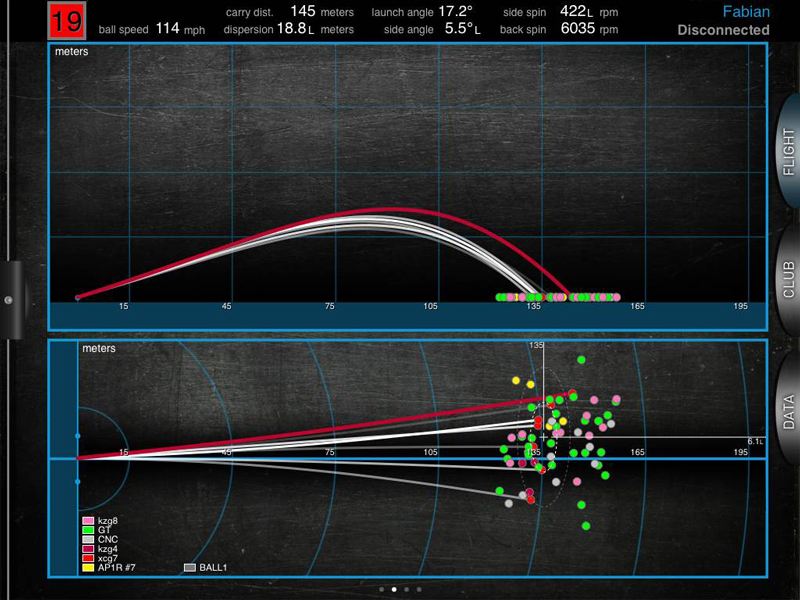 After I hit some shots with my old 7 iron, we went through the data of the Foresight GC2 launch monitor. We mainly focused on the speed, the launch angle, the spin rate, the peak hight and the carry distance. The main problems are my low spin rate, which will make it more difficult for me to attack pins, and my distance, which is not that long. As I am always afraid of missing my ball to the left side, I overcompensated a little bit and ended up mostly right of target. 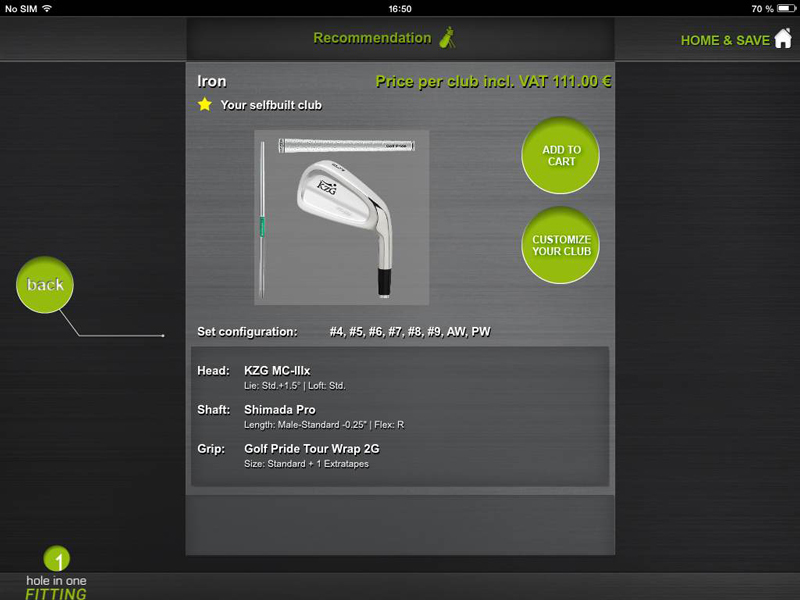 By checking the Lie angle of my old clubs, we got the first important aspect for the final recommendation. I need more upright clubs to follow a more natural swing movement. To start with the digital fitting process on the Ipad, I just put some basic data about my body, my golf level and my preferences in. Immediately the App showed me that I need to play clubs that are a little shorter, because of my long arms. Based on the size of my hands, the app recommends adding one tape extra to help me relax while gripping the club. 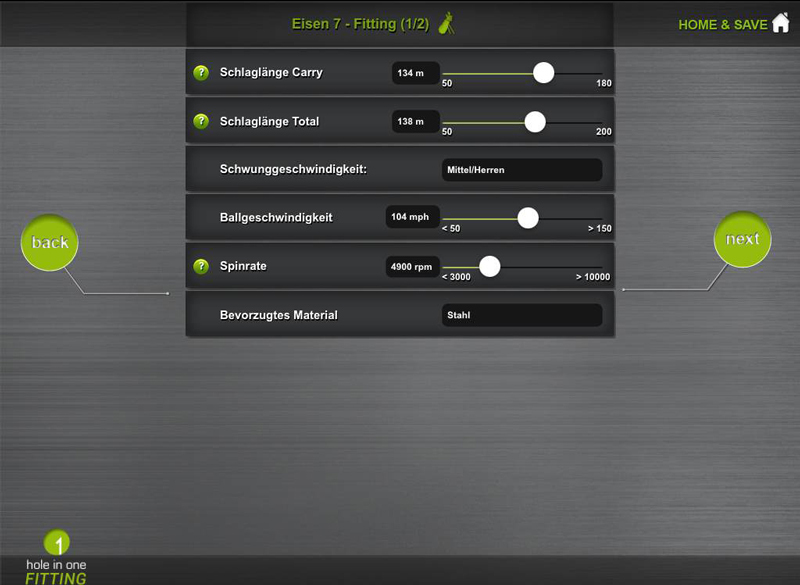 Putting all my Titleist AP1 iron 7 data from the Launch Monitor into the HIO Fitting App results in a few relevant testing options. It took us only a few minutes to go through the app, there was no time wasted. 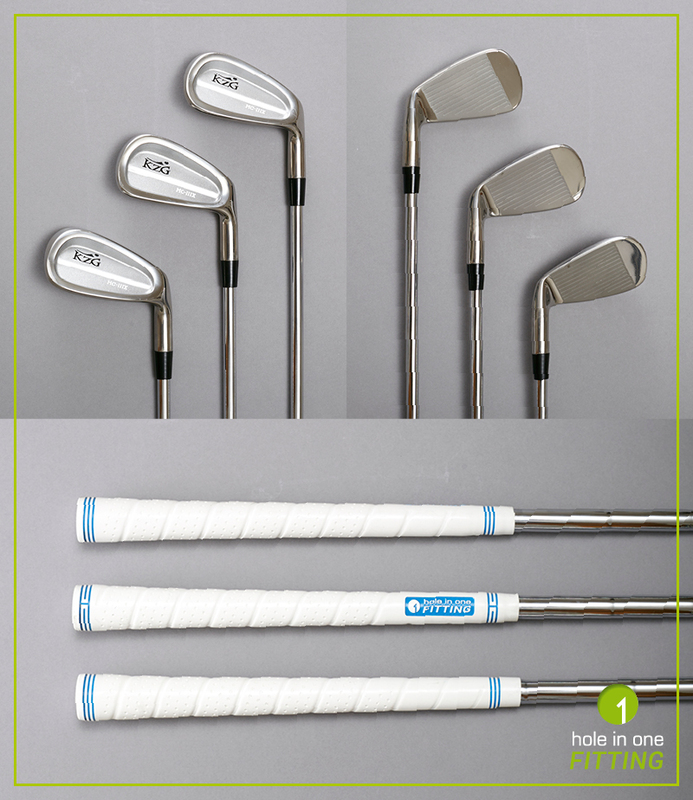 Actively participating in the fitting process is what HoleInOne-Fitting stands for during their very professional procedure. I started out comparing two heads with the same shaft. Afterwards we focused in a more detailed way on the shaft. The difference between forged and cast heads is really impressive and definitely worth checking out. I ended up comparing a model from GeoTech (Japanese brand) and KZG (American brand) with a Shimada Pro Steel shaft in Regular. 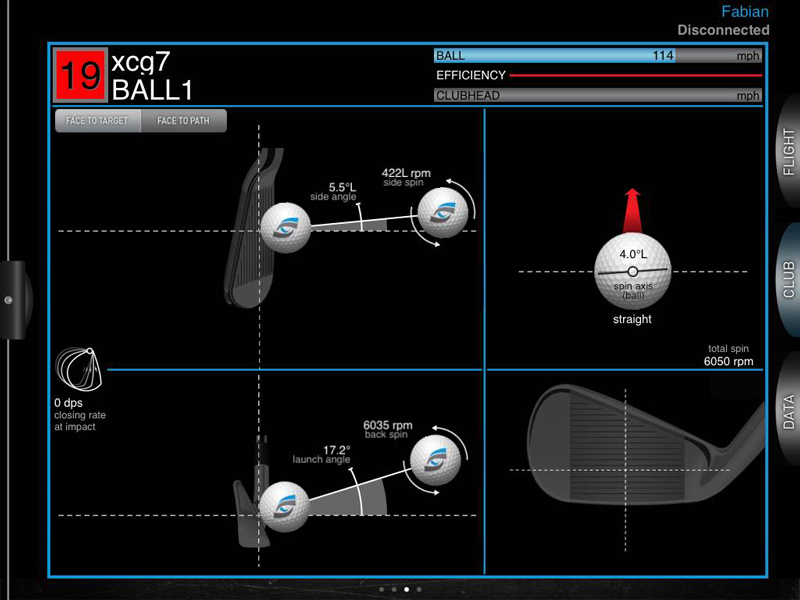 Based on very similar data on the Foresight, I made my choice due to the classic design of the KZG irons. As I am really motivated to improve my golf skills this season, the thinner sole provides a little better feedback. Furthermore I gain 10 meters more carry distance, a higher spin rate and a higher ballspeed – that plus a really great looking club was far more than I expected from a fitting before visiting the guys from HoleInOne. I’ve been playing the new clubs for 15 days now and I feel so much more confident with them. 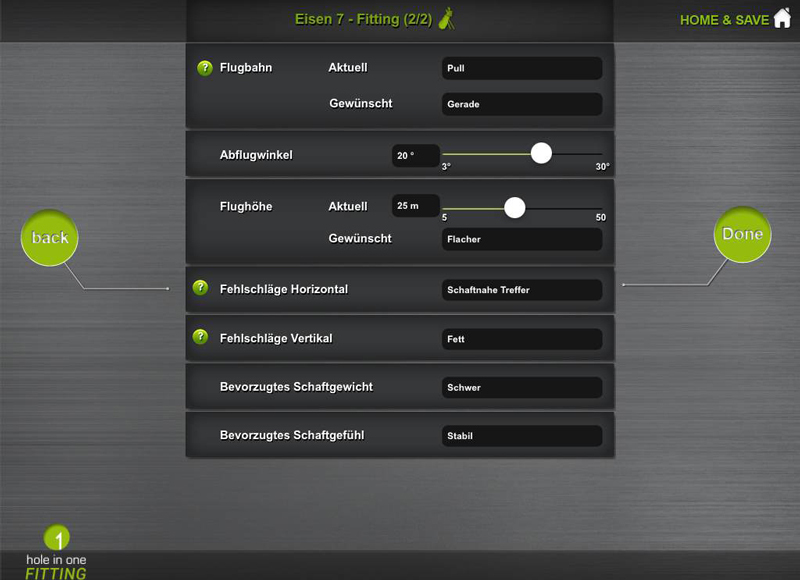 In the first few rounds I played with the new irons, I lowered my score by almost 5 to 7 hits. In my last round I had the option to hit almost every iron and I increased my distance with every single one by 10 meters or more. My game was optimized in style and you can say my bag is officially pimped by HIO-Fitting. Now I feel well prepared for the upcoming season. And one thing’s for sure …. I’m hooked on the idea of club fitting and will soon make an appointment for my Woods.